I switched over to the Live/Real $ account yesterday. No matter how much time you've spent on the Sim, the transition to the Real $ account always brings about some psychological hurdles that one has to work through. That may not be the case with a new trader who starts on Sim, and then switches over to real $, but for someone who's made hundreds of trades with dollars on the line (me), it brings back some old memories and fears. I traded piss poor yesterday placing 3 scalp trades for +1 tick each because for some weird psychological reason, I really wanted my first day on Live trading to be positive. After realizing that this was a big problem, I looked back at my journal from late 2003 and noticed that "early exits" were a problem even back then. To help solve the problem, I figured I would be more patient and give my trades time to work. Problem is, when you're entering fundamentally bad trades, the additional time only works against you. And that's what happened today. I gave my trades time to work; and that resulted in me taking full stop-outs on almost ALL of my trades today (-1.5 pts per trade). Ironically, I gave all the losers time to work, while cutting the good trades short at break-even. 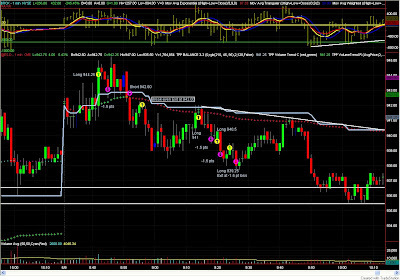 I went Long in the morning after it looked like price wasn't going for gap fill and was stopped out for -1.5 pts. After seeing the momentum shift to the downside, I entered short at 942.00 except this time, I was quick to move my stop-loss to break-even, so I got stopped out at break-even on a good entry. After that, the gap filled, and I figured we were ready to resume the up move and began hitting it Long and giving it time (to hit my stop-loss). The three Long trades that followed were fundamentally poor trades from the get go, and didn't even go with my method. I guess those could be classified as "revenge" trades :-/ After being down -5.75 pts, I figured it was best that I stop and come back in the PM session. My friend who I'm teaching was sitting right next to me, trading his own real $ account, and he entered Long at 945.50 area on the break-out of the first hour high. I told him that 946.50 was resistance from yesterday's high so it's probably best that he stay out until we get a confirmed break-out above that area, and then he can enter Long on a pullback. It'd be sweet if I followed that advice myself. 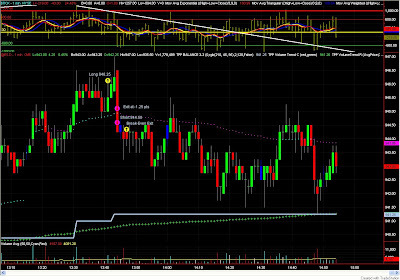 Instead, I got caught up in the price action, and hit it Long at 946.25 and was stopped out a minute later. I then immediately entered short at 944.50. That trade went a point or so in favor and then retraced back up...I had already moved my stop-loss to break-even and missed the down-side action that followed. So to summarize, I traded like an idiot today and did the complete opposite of what I should have been doing. I held the losers and cut winners at break-even. Now I can either beat myself up over an almost $400 loss, or I can try to learn from my mistakes and make a better effort later in the week. I'll go with the latter. Plus, no one day should make/break a trader. I'm just glad I didn't do too much damage. Any comments/advice appreciated. I'm not posting the stats because they're obvious from the trade chart (5 losers, 2 scratch trades, -7 pts). You are under no pressure to earn a living from trading, so just accept that each trade will go how it goes. Honor the stops and targets the best you can. Think of it as traffic tickets...it happens. Yes, easy for me to say because I am on sim. dt233, my student is down $700 or so since going Live on Friday. This is his first time on a real $ acct, so some early bumps and bruises are to be expected. Syed, it's tough. Sleep is in low supply and high demand here. mtcx, you're right. I need to chill it a bit and just trade! I know I can do it..just need to get my head right. Just part of the initial live experience. Your doing just fine and this is just small time testing the waters for now so you've got nothing to worry about. Now just amaze us the rest of the week like usual! it happens on the first day of live trading...beginners tend to be fearless, but you've had real money experience before, so you're not protected by ignorance. Regarding stops - it's best not to move them when your trade's working. I'd move stops only at places where I'd ADD contracts (except that I'm not actively adding yet, so I simply move my stops). Regarding profit-taking - you're taking it too soon now, but as you progress, you'll start to take it too late. It takes time to find out what your comfort level is. Simply using S/R is one method - when market's not terribly choppy and when your stop is far enough to accommodate those chops. That's why I hardly use horizontal S/R. I would go with trendline though. 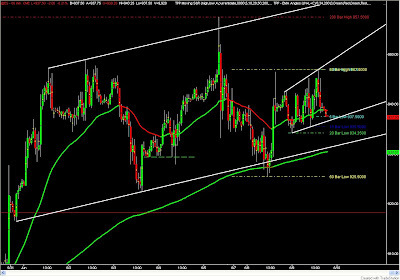 Works on the ES (coz unlike the TF, it loves to trade in channels). I know this is easy to say but difficult to carry out: just do what you've been doing on your sim trades - afterall, that was the purpose of your sim trading - to verify your strategy, ascertain your appetite for risk & reward - wasn't it? Re gaps - generally, if the gap is within a "chop" zone, and is not wide (I would consider anything over 10 points for the ES as wide), tendency is that the gap will be filled. Don't beat yourself up. You controlled your damage, and that's good! The most important part of trading is afterall capital preservation - it's NOT difficult to make money. It's keeping it that's difficult. Yes, very cliched. But you have to agree with me that it's true. I'm still envious you have a job! LOL! You will definitely start getting back on track quicker than you think - given that you don't actually need income from trading to live ie no pressure, and that you are good enough to teach someone else to trade! My questions is: Which timeframes Do you use for analysis? Good luck with whatever route you choose. The market will always be here. MvW, my priority at the moment is to wrap up my undergrad. I've been going to school part-time for way too long, and need to get this piece of paper out of the way already. That is Funny It reminds me when I started. I entered this morning at 943.27 and it started to drop. I kept my position from 10:15 all the way to the end. I just sold my position after hours at $945. Around 1 PM I was down 14 points and was sweating bullets, but was confident. Jeff, you sat through THAT much pain? WOW! That's insane man! 14 points??? That's not trading, that's not even hoping? I am angry with myself if I let anything get 3 points against me ever. One day doing that will bust your account flat. I took my biggest loss so far on sim doing something sort of similar.